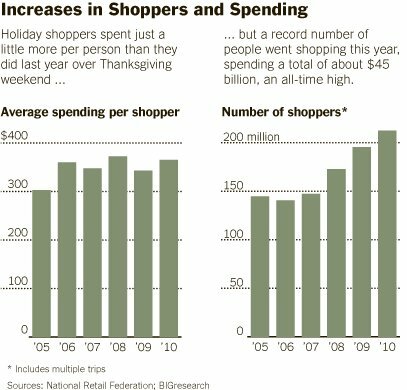 The numbers are coming in, and so far, the Holiday shopping season is off to a very respectable beginning. Mall Traffic, retail sales, even dollar volumes are all up. In some areas, improvements have been quite significant. Online sales saw very large gains. We do notice a variety of contradictions, binary conundrums and footnotes. We know the consumer has been deleveraging, but they are also suffering from Recession fatigue. (We also know that deleveraging is partly due to increased defaults). Luxe items and high end retailers saw a post-recession improvement long before department and electronics stores, but they too are improving. What this trend means for discounters like Wal-Mart (WMT) and Dollar Stores (FDO, DLTR) has yet to be determined. It would not be a surprise if they failed to keep up with non discount gainers, as our “Retail Slumming” concept of 2007 may be seeing a partial unwind. This is encouraging, but incomplete. Retailers count on November and December for about 20% of their annual profits. Note that December 15-25 is believed to account for 40% percent of holiday business. Will consumers have the strength and the money to continue the momentum? One last note: Most retail forecasts tend to be way too optimistic. We will find out if this is the year forecasters hit their marks.